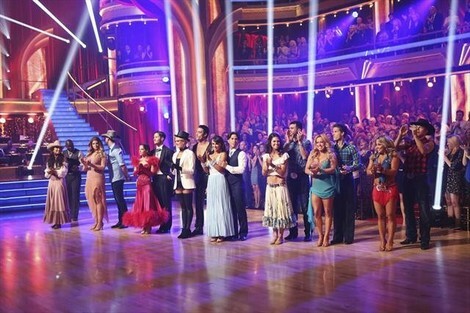 Tonight on ABC it’s the DANCING WITH THE STARS ALL-STARS Season 15 first result show. By the end of the evening tonight we will say goodbye to one more contestant. Did you see last night’s performance show? We did and we recapped it here for you. We also have all the videos of last night’s performances here! After last night’s performance at the top of the leaderboard is Sabrina Bryan and Louis Van Amstel with a 88.5/90 and at the bottom of the leaderboard is Kelly Monaco and Valentin Chmerkovskiy with a 78.5/30. We conducted a poll today to find out who YOU thought was going home tonight. Sadly 40.48% of our readers think that Kelly Monaco is on her way out tonight. Followed a close second by Kristie Alley with 34,92% of the votes. There is still time to vote go to our poll HERE! On tonight’s Result Show multi-platinum recording artist and six-time Grammy(r) winner Taylor Swift will perform her mega hit single, “We Are Never Ever Getting Back Together,” from her new blockbuster album, “Red.” In addition Grammy-winning singer and songwriter Jason Mraz will hit the stage to perform his chart topping hit single, “I Won’t Give Up,” from his latest album, “Love is a Four Letter Word.” Pro dancers Chelsie Hightower and Mark Ballas will dance during his live performance. And this week’s “Macy’s Stars of Dance” welcomes RJ Durell and Nick Florez, two of the hottest choreographers in the business, having worked with Katy Perry, Cher Lloyd and, most recently, Pink. Their dance will bring a modern day twist on Marie Antoinette, featuring incredible costumes, amazing hair and makeup, and 14 of some of the best dancers out there. By the end of the week we will lose another couple. Tonight’s episode is going to have all the usual glitz and glam in the ballroom, which you won’t want to miss. So be sure to tune in for our live coverage of ABC’s Dancing With The Stars All-Stars Week 6 Result Show – tonight at 8PM EST! While you wait for our recap, hit the comments and let us know what you thought of last night’s episode of Dancing With The Stars All-Stars. Tonight’s recap: To start the show Len and the judges decide they want to see an encore of Apolo Anton Ohno and Karina Smirnoff Viennese Waltz. Next week will be the first ever fusion dance. The couple’s get one piece of music and will have to dance two dance styles during the song.